Emyvale area was greeted by an elegant American lady named Mary O'Brien recently in search of her ancestors. Mary, who lives in Yonkers in New York City, has been visiting Ireland every summer for a long number of years to visit her friends and family in Donegal, Sligo, Mullingar, Dublin and her Husband's family, “the O Brien’s from Waterford”, and her Father's family, who are the “The Faheys” from the Galway/Westmeath border. It’s her mother and her mother's family that takes Mary to the North Monaghan area. Mary's mother was Cassie McQuaid, who was born and reared in the townlands of Knocknasave/Derrylea back in the late 1800’s, early 1900’s, not far from Killycooley. Cassie's parents were William and Mary McQuaid, who got married on February 14th 1888 and Cassie and her brothers and sisters were born. Mary O'Brien's mother Cassie moved to America back in the early 1900’s and married and settled and Mary O'Brien and her brother John were born. Over the years, Mary has found out a lot about the McQuaid side of her grandfather and indeed she is related to Father Macartan McQuaid and Gertie McNally. Mary O'Brien knew some information about her grandmother Mary McQuaid whose maiden name was Mary Fields. 10 months ago Mary got the name of Seamus Fields from Derrygasson and wrote to him to find out what he knew about the connection of Mary McQuaid, nee Fields, and him. With the help of Joe Fields, who had a lot of work done on the Fields Family Tree, it turns out that Mary O'Brien and Seamus Fields were very much related; in fact Seamus's great grandfather, Felix Fields (first Fields person to settle in Derrygasson) was a brother of Mary McQuaid, nee Fields (Mary O'Brien's grandmother). Mary O'Brien was delighted with the news and while on her annual trip to Ireland, spent a week around Emyvale area meeting new cousins including the Fields Family, Derrgasson; Anna McKenna Drummully; Mairead Loughran, Main Street and Fields Family in Emy. 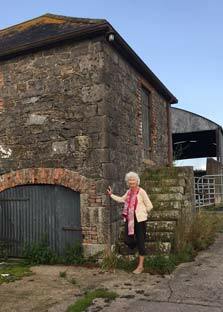 Mary went to visit the Old Barn in the town land of Mullaloughan, which is there since the early 1800’s and is still known as “ Fields Barn” as it was in the Fields family for many generations. \this is where Mary's Grandmother, Mary McQuaid, nee Fields, was born and reared before marrying William McQuaid in 1888. 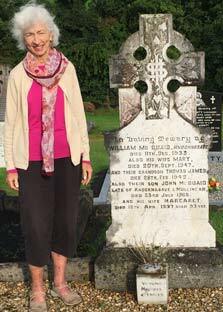 Mary also visited the grave of her grandparents, which is in Corracrin graveyard. Mary also enjoy a trip to Omagh folk park, Glaslough village, Bragan bog, a good traditional music night and in and about Monaghan town while she was based in Emyvale. She had a wonderful time and is now back safe and sound in New York City.